Springdale (KFSM) - When the Springdale Bulldogs take the field in the fall, several key players will be donning the Red Dog uniform for the first time. But it won't be their first time playing under the lights at Bulldog Stadium. "It’s not like a normal incoming sophomore, so the transition’s been pretty smooth." Thats what head coach Zak Clark says of his new faces, as Springdale picked up multiple transfers this offseason from neighboring HarBer, including quarterback Grant Allen and defensive stud Chops Sanders. Senior running back Garrett Vaughn is excited. "Chops is great, Grant is great, they’re both leaders on and off the field, they bring a physicality to the team, and I look forward to playing with them." Coming over together certainly helps with the transition, according to Allen. "Some of my best friends came in here with me, and we didn’t really know what to expect at first, but again, everyone’s been great,' says the QB, who started for HarBer last season. And their skill set on the field doesn’t hurt. "They put pieces in where we’re missing, Chops is one of our big leaders," says safety JaJuan Boyd. "He’s got a great arm, great vision,' Vaughn says of Allen. "But something spectacular about him is his escapability, his ability to get out of the pocket and escape defenders coming in on him." 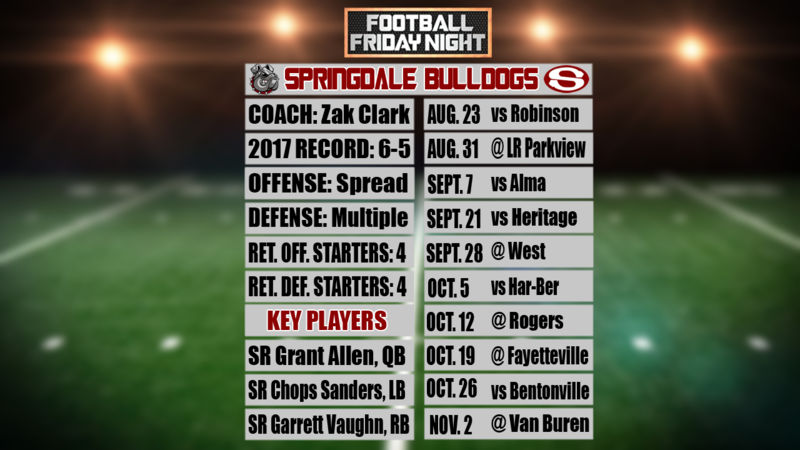 Vaughn, who missed several games last year with a broken hand, might be the real key to this Springdale offense, says coach Clark. "He's probably a bit underrated, but if you look at the numbers before the injury, they're up there with anyone." Indeed, despite the injury, Vaughn still put up 644 yards and 12 touchdowns a year ago. Clark took over a winless program, and has improved that total every year, going from two wins in year one to four in year two, to six wins last season. The key to continuing that improvement this year, is getting everyone to buy in, regardless of what jersey they may have worn in the past.
" They've been jumping in, fitting in to our culture, you know, they won their teammates over."